The machines in the VMC MT series are ideal production systems for chucked parts with complex geometries. 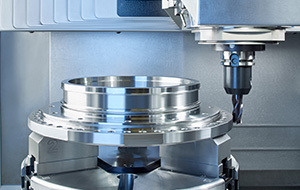 Whether they are used for prototype production or for fast changes in small production runs, the VMC MT series from EMAG is ideally designed to meet the demands of flexible production situations thanks to the ergonomic accessibility of the machining area and the bottom-mounted workpiece spindle. Offering several equipment options for the customer to choose from, the basic design of the VMC 300 MT, VMC 450 MT or VMC 600 MT remains the same. The machine base is made of Mineralit® plolymer concrete featuring particularly good damping properties. The turning / milling spindle is mounted on a compound slide with X- and Z-axes to produce excellent, fast machining results. The workpiece itself is clamped on one of the three bottom-mounted spindles available, 49, 83, or 103 / kW, each tailored to the machining job to suit the customer’s demands. Thanks to the designed accessibility to their machining area, workpieces can be easily loaded by hand, using a crane, or, alternatively, they can be connected to robots or gantry loaders using an NC-controlled loading hatch on the side. This maintains excellent access to the workpiece and clamping chuck. Universality is the main feature of the VMC MT series, which can be configured to suit almost any customer demand. For example, not only is the whole range of turning, drilling and milling technologies available, but the turning / milling spindle is also available in two versions, with a rating of either 26.4 kW or 43 kW. However, the use of a tool magazine allows the most complex geometries to be achieved with a wide variety of parts, making the VMC MT machine a genuine wonder of productivity. Various magazines with up to 80 tool positions can be selected. The wide choice of tools is also a striking feature when it comes to retooling times and the overall equipment effectiveness (OEE) can be increased by up to 30% as a result. Only the clamping method must be tailored to the workpiece, the tool buffer is fitted with an adequate number of tools at all times. The operating condition of each tool is ensured by a laser measuring bridge outside the machining area that checks the wear, the diameter of the tools and the tip distance to base of turning tools to ensure that the machine produces a perfect production result every time. An interchangeable radio probe can be used for quality management purposes and to check the workpiece quality. The VMC MT series is not just convincing in terms of its machining quality. EMAG’s decades of experience with vertical turning machines also comes to the fore in the excellent ergonomics of the machines. Both the machining area and all maintenance components are easy to access, demonstrating that the design of the machine was centered on small production runs with a wide range of workpieces and on prototype production. Machine operators can take advantage of the tailored working conditions, which also help to make the machine so productive. With the VMC MT series, EMAG offers a new machine system for chucked parts suited to the production even of the most complex workpieces in many different manufacturing scenarios thanks to its flexibility. Whether components for the aircraft industry, trucks, construction or agricultural machinery, the universal nature of VMC MT Series makes it relevant for almost every sector. The machines are an all-around solution for chucked parts, above all for frequently changing component families that take advantage of their highly flexible adaptability. Axis monitoring by rotary, indirect absolute encoders. All axes with fully encapsulated linear glass scale (optional).